At TNNA a few months ago, I discovered something I hadn’t realised before. Talking to several of my fellow dyers, I became aware that many of them have large collections of different dye colours that they work from. In some cases, dozens of different shades of powder that they use to dye their yarn. That took me by surprise, because we don’t use anything like that many dyes. In fact, we use only 5 colours of dye: cyan, magenta, yellow, red, and black — the primary colours in the CMYK and RYB color models. And we then use these primary colours to hand-mix all the hundreds of other hues that we use on our yarns. When you look at a SpaceCadet colourway, no matter what shades you are seeing, they are all created from those five colours of dye. I started out this way for one simple reason: when I first began dyeing, I just couldn’t afford to invest in that many colours of dye. I sat down with my notebook and wrote the names of all they dyes I wanted to try — Pumpkin, Chartreuse, Salmon, Periwinkle… The list went on and on but, when I tallied up the price, I realised how quickly all those lovely-sounding colours added up. Disappointed, I told myself I’d have to make do for the time being with only the primary colours and I placed my smaller (but much more affordable) order with the dye manufacturer. I always planned to widen my colour selection when finances allowed, but then an odd thing happened: I found I could make every colour I wanted myself! Good old colour theory and the primary colours didn’t let me down — by mixing those five colours in different configurations, I could achieve everything I’d hoped to buy …and more. By the time I could afford a whole palette of pre-mixed dyes, I realised I didn’t want them. The joy of dyeing for me was not about applying someone else’s colour to my yarn — it had become about making my own colours, creating them completely from scratch, and controlling the tiniest changes from one hue to another. I guess, really, it was no longer just about the dyeing. It was thrill of hunt when I spotted a colour I wanted to recreate — maybe the searing blue of the sky on a clear day, the rust on an old Pittsburgh bridge, the grey of a tire left out too long in the sun — and I’d spend a little time really looking at the the object to reverse engineer the colour… then rush to the studio to try to capture it before the memory was gone. I’d mix a bit of magenta with a glug of yellow, throw in a splash of black, and… let the yarn soak it up and find out if I’ve hit it. No, if dyeing is about putting colour on yarn, this was so much more — this was about about the hands-on creation of every single shade I produced. 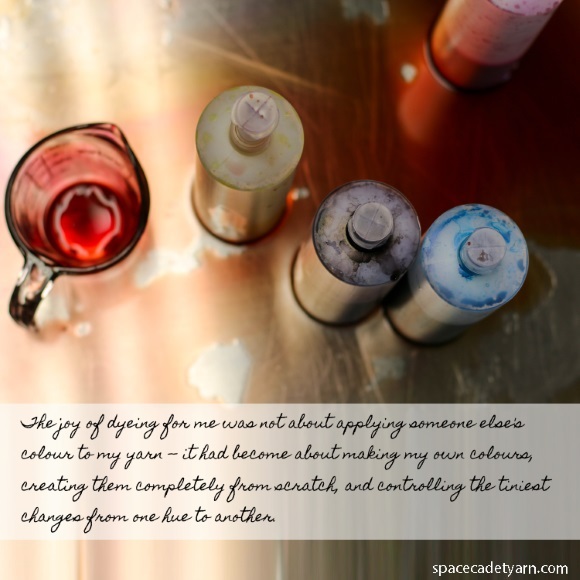 And for me, that’s where I find real artistry when I’m dyeing. Five years later, SpaceCadet could afford to buy all the colours I so longed for in the beginning, but we still mix from just five colours of dye I started out with. And it wasn’t until that weekend at TNNA that I realised that might be a little unusual. 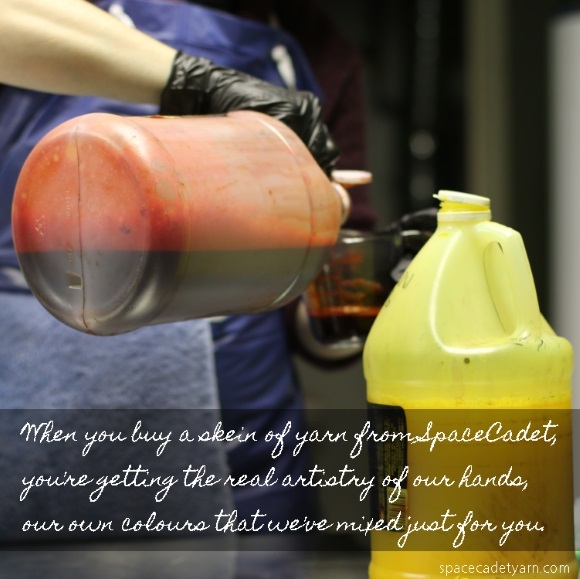 When you buy a skein of yarn from SpaceCadet, you’re getting the real artistry of our hands, our own colours that we’ve mixed just for you. 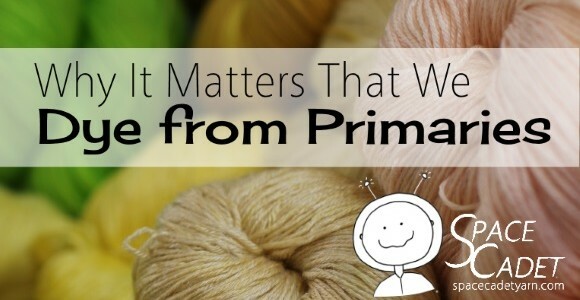 In all honesty, I think that’s what our customers really value when they’re working with hand-dyed yarn — a real connection from one maker to another. And I have to admit, I’m pretty proud of how we make what we make! Want to experience our dyeing all year long? Our premiere yarn club, the InterStellar Yarn Alliance is open for subscriptions from now until Sept 20. It opens only twice a year, so don’t miss your chance to get our best dyeing delivered directly to your door all year long! Members of the Yarn Alliance receive gorgeous yarns in exclusive club-only colourways, fabulous gifts, the chance to order extra skeins, 15% off a future SpaceCadet order and so much more! Click here to see our gallery of colourways and to join this fab club. 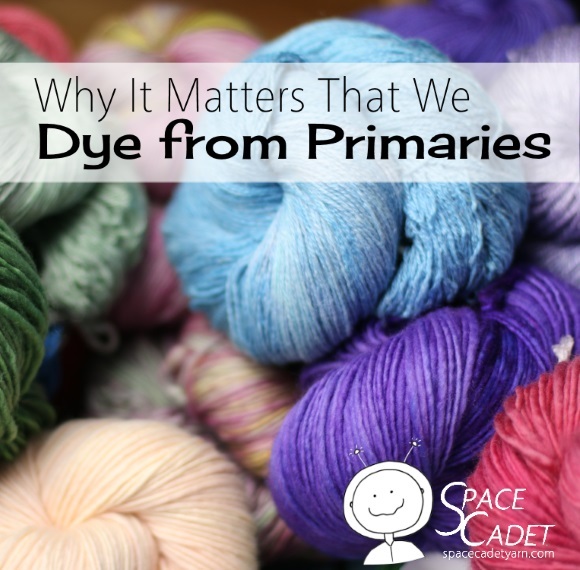 I’ve fallen in love with Periscope — tune in and catch me live to chat about dyeing from primaries and ask questions about the Yarn Alliance! If you’re not on Periscope, you’ll need to download the app (click here for iOS or here for Andriod), then follow me by searching for SpaceCadetYarn. You’ll get a notification when I start broadcasting — when you do, hop on and start chatting with me live, right there and then. I’ll see you there! This entry was posted in Blog, Resources: Posts about Hand-Dyed Yarn, Scenes from a Fiber Life and tagged dyeing from primaries, primary colours. Bookmark the permalink. Squeeee! Today is the Day! I’m so curious to know what specific dyes you use. I think finding a great “base” primary is tough. How much yarn is in the alliance club mailing?